This landmark volume provides a detailed description and analysis of Educational Testing Service’s research and development efforts to develop a major revision of the TOEFL® test. The result is a book that serves as a case study of test design drawing upon theory in the complex domain of English language proficiency while attempting to meet standards of educational measurement. 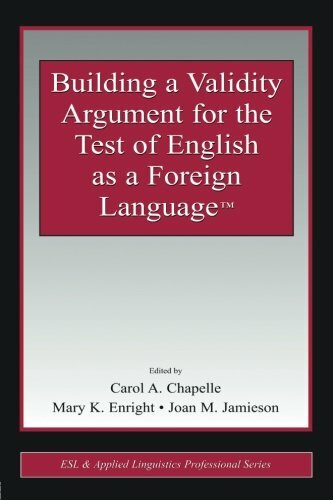 Building a Validity Argument for the Test of English as a Foreign Language™ is distinctive in its attempt to develop a coherent story of the rationale for a test or its revision, explain the research and development process, and provide the results of the validation process. Through its treatment of one test, it expands on and tests principles and approaches to educational measurement, providing an in-depth, integrated perspective on the overall process of test revision. Moreover, because the conceptual foundation and history are presented alongside the empirical studies and validity argument, these sometimes disparate areas are presented in a way that demonstrates their connections – an approach which represents a departure from, or extension of, conventional materials on test revision. This volume is particularly relevant for professionals and graduate students in educational measurement, applied linguistics, and second language acquisition as well as anyone interested in assessment issues.